It's Wednesday. Time to trade? 1. 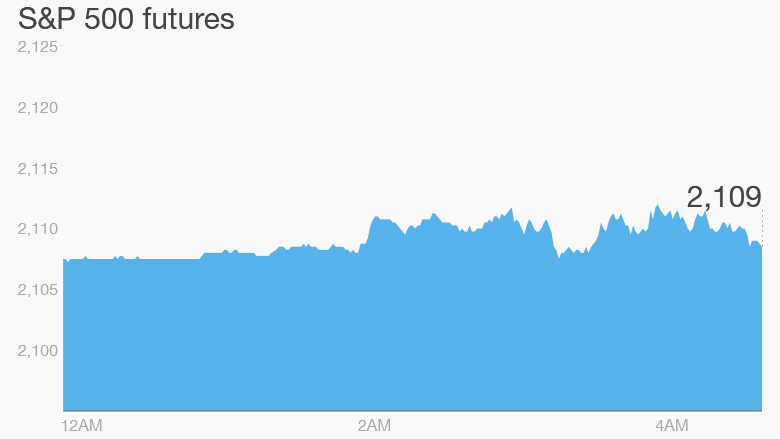 Calm markets: U.S. stock futures are edging up and European markets are mixed in early trading. Many investors are noting that the markets have been surprisingly calm in the last few weeks. In fact, this spring has been one of the most tranquil periods for American stocks since the 1960s. In Asia, most key stock markets declined, but Chinese indexes edged up. 2. Stocks to watch -- Google, Humana: Shares in Google (GOOGL) could see higher trading volume Wednesday as the company holds its annual meeting for shareholders. Some are demanding that the company fully disclose all of its spending on lobbying. There will be a vote on the issue during the day. Shares in insurance giant Humana (HUM) are moving up as investors expect it will increase its premiums on some Texas health plans by as much as 30%. Other insurers are proposing similar plans. 3. Economic announcements: On the economic side, the U.S. Census Bureau is releasing trade balance data at 8:30 a.m. ET. Data on crude oil inventories will come out at 10:30 a.m. Ahead of the release, crude prices are declining by about 1% to trade aroud $60.60 per barrel. At 2 p.m., the U.S. Federal Reserve is releasing its Beige Book. The publication offers anecdotal information on the state of the economy. 4. Greece: The crisis over Greece's enormous debts is coming to a head. Its international creditors are expected to present an agreed list of reforms to Greek officials later Wednesday, according to reports. The European Central Bank announces its latest policy decision but is unlikely to make any change. More attention will be focused on what ECB President Mario Draghi has to say about the situation in Greece. 5. Earnings: It's a relatively quiet schedule for earnings. Vera Bradley (VRA) is reporting ahead of the open. Five Below (FIVE) and Leapfrog (LF) will report after the close. 6. Tuesday market recap: All the major indexes took a small dip on Tuesday. The Dow Jones industrial average, S&P 500 and Nasdaq each declined by roughly 0.1%.